Draft: 2008, Washington Nationals, 3rd rd. Daniel Richard Espinosa...Was a three-year starting shortstop at Long Beach State...In 2006, was named Freshman All-American by Collegiate Baseball... Left LBSU as one of 12 Dirtbags to earn all-conference status three times...Represented USA Baseball in summers of 2003 (Youth National Team, 16-and-Under) and 2007 (Collegiate)...Played for Chatham in the 2006 Cape Cod Baseball League...Was a two-time All-CIF and All-League selection at Mater Dei (CA) High School...Father, Dan, played baseball at Northern Arizona and the University of Arizona...Brother, Brandon, played at UC Riverside. Combined with Los Angeles-AL, Seattle and Tampa Bay to hit .173 (46-for-266) with 30R, 10doubles, 6HR and 31RBI in 93 games…made his seventh Opening Day roster with the Angels and batted .162 (37-for-228) with 27R,8 doubles, 6HR and 29RBI in 77 games…was designated for assignment on 7/16 and unconditionally released on 7/22…signed aMajor League contract with the Mariners on 7/24…appeared in eight games for Seattle, hitting .188 (3-for-16) with 2R, 2 doubles and2RBI…was released on 8/20 and unconditionally released on 8/22…was signed by the Rays to a Major League contract on 8/25 andappeared in eight games, batting .273 (6-for-22) with 1R and 1BB…was outrighted on 9/20 and released on 9/21. In seventh season with the Nationals, set new career-bests with 24 home runs and 72 RBI...His 24 homers ranked fourth in the Majors by a shortstop while the 72 RBI were ti ed for eighth...Became just the second shortstop (fourth occurrence) in Washington franchise history (includes Montreal) to log a 20 HR/70 RBI season, joining Ian Desmond...Ranked in the Top 10 in several off ensive categories by a switch hitt er including hits (10th), doubles (T10th), home runs (2nd), RBI (T2nd), walks (6th) and intenti onal walks (1st)...Tabbed as the Nati onal League Player of the Week for the period ending July 3...Drew 20 hit by pitch, the most by a Washington/Montreal player since F.P. Santangelo's 23 in 1998...According to FanGraphs.com, his eight defensive runs saved ranked eighth in the Majors by a shortstop and marked the second highest of his career at any positi on (10 DRS in 2015 playing second base). Clubbed 13 home runs, his most since 2012 and his .409 slugging percentage was his highest since 2011...Despite significantly fewer games played than his counterparts, ranked fourth among National League second baseman in home runs and slugging percentage...Posted a career-best .709 OPS as a left-handed batter and his .409 slugging percentage from the left side was his best since 2010 (.410)...If qualified, would've ranked first in UZR/150 (18.4) and third in defefensive runs saved among MLB second basemen (10)...Recorded his third career multi-home run game, May 8 at Atlanta...Hit his first career pinch-hit home run, Aug. 15 at San Francisco (Petit)...Recorded a career-high five hits (and HBP), June 16 at Tampa Bay to become the third National to reach base six times in a game (Nick Johnson, Elijah Dukes)...Was one of eight players to reach base safely six times in a nine-inning game...Appeared at second base (81 games/74 starts), third base (16 games/nine starts), shortstop (eight games/five starts), first base (five games/five starts) and left field (five games/two starts)...Was shut down in September with a right hamstring strain. Bounced back from wrist injury that plagued 2013 season...Started off strong in the month of April, hitting .291 (23-for-79) with five doubles, one triple, and three home runs in 25 games...Hit lefthanders hard in 2014, batting .301 (31-for-103) with eight doubles, three home runs and 10 RBI, posting an .859 OPS...Led off ninth inning with game-tying solo homer in game ultimately won by the Nationals, 6-5, on May 12 at ARI...Saw action at second base (89 games/77 starts) and shortstop (12 games/8 starts)...Ranked tied for 10th in the NL with 12 HBP. Struggled early (hit .173 in April, .155 in May) and spent majority of season with Triple-A Syracuse...doubled, homered and tallied a game-high 3 RBI to trigger an 8-1 win, April 25 vs. CIN...was placed on the DL on June 4 (retro to June 3) with a right wrist fracture...after rehab assignment, was optioned to Syracuse on June 19 ...hit .099 in first 21 Triple-A contests, but batted .254 with 10 doubles and 19 RBI in final 54 contests. In 2nd season as an everyday player, increased offensive output with .247 batting average, 37 doubles, 56 extra-base hits, 20 stolen bases and 82 runs...hit .232 with 7 homers and 24 RBI before All-Star break and .264 with 10 home runs and 32 RBI thereafter...with 160, became just the 3rd National (2005-12) to play in at least 160 contests in a single season (Ryan zimmerman-162 in '07, Austin Kearns-161 in '07)...with Desmond (left oblique) on DL for 25 games, July 22-Aug. 16, shifted to shortstop and hit .288 with 7 doubles, 5 homers & 16 RBI...tied for 4th in NL with 13 HBP. Strong campaign (.236, 29 doubles, 21 home runs, 66 RBI, 17 stolen bases) rendered one of finest rookie seasons in MLB ... earned spot on Topps 53rd Annual All-Rookie Team ... 21 home runs tied for the NL rookie lead with Freddie Freeman and tied for the second-largest total ever hit by a rookie second bagger (Dan Uggla, 27 for FLA in 2006) ... set franchise rookie record by hitting 21st homer, a game-winning 2-run shot in the 6th inning of a 7-5 victory, Sept. 21 at PHI ... the previous mark, 20, had been shared by Ryan Zimmerman (2005) and Brad Wilkerson (2002) ... paced NL rookies with 72 runs, 55 extra-base hits and 57 walks ... led the Nationals with 158 games ... stellar first half included 16 home runs, which set a MLB record for long balls hit by a rookie second basemen prior to the All-Star break ... true two-way player led NL second baggers in zone rating (.841) and total chances (783) ... with 101, also became the 4th second baseman in franchise annals to have a hand in 100-plus double plays in a single season ... posted the game-winning RBI in both games of doubleheader sweep on April 17 vs. MIL ... two-run shot in the 7th inning on May 16 snapped tie and capped scoring in a 4-2 win vs. PIT ... on May 31, hit 2 home runs to trigger a 10-2 win vs. PHI and became the first rookie second baseman in MLB history to hit 10 homers before the end of May ... just minutes before a major thunderstorn rolled through DC, drilled game-winning three-run shot in 10th inning to cap 7-4 win vs. STL on June 16 ... hit decisive homer, a two-run shot in the 7th inning, as Washington posted a 2-1 rubber game win at CWS on June 26. Burst onto the MLB scene, posting 6 homers and 15 RBI in 28 games as the Nationals' most intriguing September callup...went 9-for-16 with 3 home runs and 10 RBI in first 5 games with Nationals...made big league debut and recordedfirst hit with 6th-inning double off Burke Badenhop, Sept. 1 at FLA...hit first home run, a solo shot off Zach Duke, in2nd career game, Sept. 3 at PIT...went 4-for-5 with 2 home runs (solo shot, grand slam) and 6 RBI, Sept. 6 vs. NYM...paced Nationals with 11 extra-base hits in Sept./Oct...batted .306 with runners on base and .333 with runners inscoring position...in minor leagues, with 22 home runs and 25 stolen bases, was one of only 3 players in Minor LeagueBaseball to reach the 20-20 mark in 2010. Ranked among the Single-A Carolina League leaders in nearly every offensive category, including runs (first, 90), walks(2nd, 74), homers (4th, 18), total bases (5th, 218) and OBP (5th, .375)...18 homers and 72 RBI both 4th best amongNationals farmhands...hit .345 with 15 RBI and 14 walks in 24 Arizona Fall League contests playing for Phoenix. Hit .328 and posted .476 OBP in 19-game pro debut with Vermont of the short-season Single-A New York Penn League. February 8, 2019 New York Mets signed free agent 2B Danny Espinosa to a minor league contract and invited him to spring training. 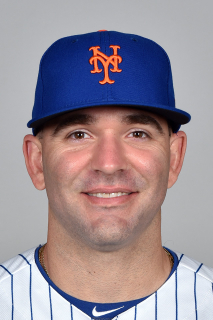 February 8, 2019 2B Danny Espinosa assigned to Syracuse Mets. October 12, 2018 IF Danny Espinosa assigned to Naranjeros de Hermosillo. October 12, 2018 Naranjeros de Hermosillo placed IF Danny Espinosa on the reserve list. August 14, 2018 Acereros del Norte signed free agent SS Danny Espinosa. August 8, 2018 Lehigh Valley IronPigs released SS Danny Espinosa. June 25, 2018 SS Danny Espinosa assigned to Lehigh Valley IronPigs. June 22, 2018 Philadelphia Phillies signed free agent SS Danny Espinosa to a minor league contract. May 30, 2018 Oklahoma City Dodgers released SS Danny Espinosa. May 6, 2018 Los Angeles Dodgers signed free agent SS Danny Espinosa to a minor league contract. May 6, 2018 SS Danny Espinosa assigned to Oklahoma City Dodgers. April 29, 2018 Buffalo Bisons released SS Danny Espinosa. April 2, 2018 SS Danny Espinosa assigned to Buffalo Bisons. March 17, 2018 Toronto Blue Jays signed free agent SS Danny Espinosa to a minor league contract and invited him to spring training. March 12, 2018 New York Yankees released SS Danny Espinosa. February 2, 2018 SS Danny Espinosa assigned to Scranton/Wilkes-Barre RailRiders. January 29, 2018 New York Yankees signed free agent SS Danny Espinosa to a minor league contract and invited him to spring training. September 22, 2017 Durham Bulls released SS Danny Espinosa. September 21, 2017 Tampa Bay Rays sent SS Danny Espinosa outright to Durham Bulls. September 21, 2017 Tampa Bay Rays designated SS Danny Espinosa for assignment. August 25, 2017 Tampa Bay Rays recalled SS Danny Espinosa from Durham Bulls. August 25, 2017 Tampa Bay Rays signed free agent SS Danny Espinosa. August 25, 2017 SS Danny Espinosa assigned to Durham Bulls. August 20, 2017 Seattle Mariners released 2B Danny Espinosa. July 24, 2017 Seattle Mariners signed free agent 2B Danny Espinosa. July 20, 2017 Los Angeles Angels released 2B Danny Espinosa. July 16, 2017 Los Angeles Angels designated 2B Danny Espinosa for assignment. December 10, 2016 Washington Nationals traded 2B Danny Espinosa to Los Angeles Angels for RHP Austin Adams and Kyle McGowin. September 30, 2013 Washington Nationals recalled SS Danny Espinosa from Syracuse Chiefs. June 19, 2013 Washington Nationals optioned Danny Espinosa to Syracuse Chiefs. June 13, 2013 Washington Nationals sent 2B Danny Espinosa on a rehab assignment to Syracuse Chiefs. June 4, 2013 Danny Espinosa roster status changed by Washington Nationals. November 24, 2010 Leones de Ponce placed SS Danny Espinosa on the reserve list. October 22, 2010 SS Danny Espinosa assigned to Leones de Ponce. September 1, 2010 Washington Nationals selected the contract of 2B Danny Espinosa from Syracuse Chiefs. August 6, 2010 Danny Espinosa assigned to Syracuse Chiefs from Harrisburg Senators. July 15, 2010 Danny Espinosa roster status changed by Harrisburg Senators. July 11, 2010 Harrisburg Senators placed SS Danny Espinosa on the temporarily inactive list. April 24, 2010 Harrisburg Senators activated SS Danny Espinosa from the 7-day disabled list. April 12, 2010 Harrisburg Senators placed SS Danny Espinosa on the 7-day disabled list retroactive to April 10, 2010. April 4, 2010 SS Danny Espinosa assigned to Harrisburg Senators from Potomac Nationals. March 4, 2010 SS Danny Espinosa assigned to Washington Nationals. August 11, 2008 Washington Nationals signed SS Danny Espinosa.